Here is an extensive article that just appeared in The Economist covering EdTech and Adaptive Learning. EdTech is finally catching on. That is good news for us at ForDyslexia. Do you or your school use adaptive technology? What is your experience with edtech? Please let us know in the comments section below. IN A small school on the South Side of Chicago, 40 children between the ages of five and six sit quietly learning in a classroom. In front of each of them is a computer running software called Reading Eggs. Some are reading a short story, others building sentences with words they are learning. The least advanced are capturing all the upper- and lower-case Bs that fly past in the sky. As they complete each task they move through a cartoon map that shows how far they have progressed in reading and writing. Along the way they collect eggs which they can use to buy objects in the game, such as items to furnish their avatar’s apartment. Now and then a child will be taken aside for scheduled reading periods with one of the two monitoring teachers. The director of North Kenwood-Oakland school says this sort of teaching, blending software with human intervention, helps her pupils learn faster. It also allows teachers at this school—which, like other charter schools, is publicly funded but has some freedom to teach as it likes—to spend more time teaching and less time marking written work and leading pupils through dull drills of words and numbers. On top of that the school gains an accurate, continuous record of each child’s performance through the data its various programs collect and analyse. The idea that technology can revolutionise education is not new. In the 20th century almost every new invention was supposed to have big implications for schools. Companies promoting typewriters, moving pictures, film projectors, educational television, computers and CD-ROMS have all promised to improve student performance. A great deal of money went into computers for education in the dot.com boom of the late 1990s, to little avail, though big claims were advanced for the difference they would make. These claims were not entirely false: some bright, motivated children did use new technologies to learn things they would have missed otherwise. In many classrooms, too, computers have been used to improve efficiency and keep pupils engaged. But they did not transform learning in the way their boosters predicted. It is wise, therefore, to be sceptical about the claims made for the current wave of innovation. Yet there are also reasons to believe that a profound shift is occurring. Over the course of the 20th century mass education produced populations more literate, numerate and productive than any the world had seen before. But it did so, usually, in an impersonal manner, with regimented rows of children chanting their times-tables as Teacher tapped the blackboard with a cane. Schooling could never be tailored to each child, unless you employed lots of teachers. Teaching programs that monitor children’s progress can change that, performing a role more like that of the private tutors and governesses employed long ago in wealthier households. Data derived from each child’s responses can be used to tailor what he sees or hears next on the computer screen. The same data also allow continual assessment of his abilities and shortcomings, letting schools, teachers and parents understand both the pupil himself and the way human beings learn. Such learning—called “adaptive” in the trade—is not the only advantage technology offers to today’s teachers and pupils. Online resources, from wikis to podcasts to training videos, are allowing both children and adults to pursue education on their own, either instead of learning in schools or colleges or as a supplement. It is, in the words of Bill Gates, who follows developments in this area closely and whose foundation funds some of them, “a special time in education”. This is in part because it is a special time for information technologies in general. The capacity, and mindset, to design systems that use and make sense of large amounts of data gathered on the fly is coming of age. This makes it possible to track things like the “decay curve”, which governs a pupil’s fading recall of what has been taught. And more or less everything is getting remarkably cheap to provide, thanks to faster processing, widely available broadband and the resources of cloud computing. Mr Gates says that putting an hour of video online cost $400 in the late 1990s. Today it costs around two cents. The main reason for optimism, though, is the evidence coming in from classrooms. Adoption of education technology in America’s state-funded schools was given a boost by a requirement to measure pupil performance in the No Child Left Behind Act, signed by George W. Bush. Online learning was first picked up in some surprising places, including rural Idaho, where schools were looking for ways to expand the limited curriculums they were able to offer. Barack Obama’s Race to the Top initiative gave a further shove, making billions of dollars available to states willing to innovate. At the beginning of June his administration announced a plan to give 99% of America’s students access to high-speed internet within five years. Those schools that have pressed on have done rather well. Rocketship, a chain of seven charter schools in San Jose, California, blends traditional teaching with at least an hour a day of individualised online instruction in mathematics, literacy and comprehension. Its low-income pupils outperform those living in the wealthiest districts in the state. Over on the east coast Mark Edwards, superintendent of the Mooresville graded school district in North Carolina, introduced personalised learning on laptops for all pupils aged ten and over in 2009. His district is now one of the state’s leading performers, despite being close to the bottom in funding per pupil. Between 2009 and 2012 the share of its pupils considered proficient in maths, science and reading rose from 73% to 88%. As well as evidence from these schools, the effectiveness of particular bits of software has been studied. The Department of Education spent four years evaluating literacy programs; it concluded that Read 180, a program to help students who have fallen behind in reading, was good at combating adult illiteracy. A randomised control trial of Cognitive Tutor, which helps teachers identify weaknesses and strengths in maths, among 400 15-year-olds in Oklahoma found that children using the program reached the same level of proficiency as the control group in 12% less time. Meanwhile, the Khan Academy, a creator of online tutorials widely used as a form of home tutoring, is beginning to provide hard evidence for why it is considered one of edtech’s rising stars. At Oakland Unity, in tough inner-city Oakland, test scores for 16-17-year-olds in algebra and geometry have risen significantly in the two years since Khan courses were introduced. These courses are now being adopted by the Los Altos school district, also in California, which is already one of the best-performing in America. Khan Academy pinpoints the way in which edtech can turn conventional education on its head: in its “flipped classroom” pupils are no longer given lectures in the classroom and set problems as homework, but watch instructional videos at home and work on problems in class, where teachers and peers can help them. In short, though, this latest wave of education technology is too new and eclectic to have proved its worth definitively. It is still mostly a matter of patching together different bits; only Amplify, the education arm of Rupert Murdoch’s News Corporation, claims to have a product (available on tablets) that offers an integrated curriculum for a child. Research also suggests that the way the technology is used in the classroom is at least as important as having it there. “It is appalling how little is actually known about the outcomes produced by various forms of online learning,” says William Bowen, once president of Princeton University and author of a new book on technology in higher education, a field that is also being revolutionised thanks to online courses known as MOOCs. This uncertainty has not stopped companies from wagering lots of money on its success. Several big education companies have been investing heavily in technology ever since the 1990s. Pearson (a part-owner of The Economist) says it has spent over $9 billion in the past decade on technological upgrades for its education business. News Corp is also taking a big bet on Amplify, run by Joel Klein, a former chancellor of schools in New York City (and one-time antitrust nemesis of Mr Gates). Amplify’s office, in an old warehouse in New York’s DUMBO district, contains not only classrooms, where students and teachers use new technology, but groups of former teachers working with software engineers, graphic artists, psychometricians and game designers to produce new content. Much of the new technology at Amplify and elsewhere leans strongly on what has been learned in the games industry and in social-network businesses. Games get pupils more engaged, says Nt Etuk, the founder of DimensionU, which develops interactive games to teach mathematics and science. A lot of programming, design and artistry go into creating apps where students can compete with or assist each other, and which reward successful activity. 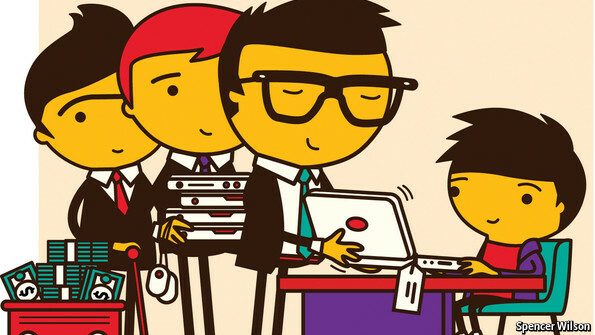 One of the main global mathematics websites, Mathletics—used by children in Pakistan, Saudi Arabia, Hong Kong, Britain and New Zealand as well as America—allows children to earn certificates, appear on international leader boards and earn “gold coins” which they can use to buy upgrades to their avatars. Kaplan, an education company owned by the Washington Post, has recently announced a partnership with Badgeville, a “gamification” specialist that works in all sorts of industries, to come up with learning games that can recognise good achievement by displaying badges on the screen. Other organisations funding the application of all this potential to education include companies who, like Pearson, are already established in education as providers of textbooks and other resources; companies already established in technology who see big new markets (Apple says it sold 3m iPads to American educational institutions last year); and companies established in other businesses who see edtech as a big opportunity. Then there are legions of start-ups, backed by an American venture-capital crowd that has proclaimed edtech to be the new thing. 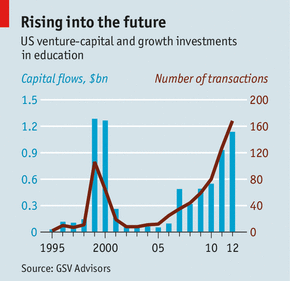 According to GSV Advisors, a consultancy, investment in edtech soared to $1.1 billion in 2012. The Education Innovation Summit held in Scottsdale in April was crawling with would-be investors; presentations from new companies were packed. Investment in the education sector in 2011 was almost as high in nominal terms as the dot.com peak, and was higher in terms of volume (see chart). 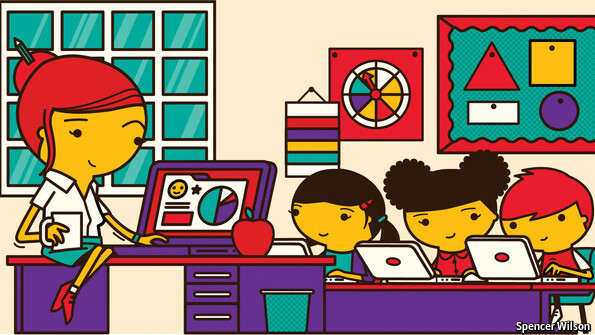 Data-driven technology may have more impact on education in developing countries, but the first big wave of investment and experimentation is in America, which has a large technology industry, venture capitalists and philanthropists with experience in the field, and a culture of eagerly trying new things. It also has the promise of markets both large (the state school curriculum is increasingly uniform) and niche (in specialised schools). For all that, formidable barriers still exist to getting education technology into America’s schools. These range from the prosaic to the ideological. America’s 13,000 school districts still upgrade their texts and equipment on slow, unsynchronised cycles and follow a bewildering range of procurement processes. Glenn Anderson, a former Washington state legislator and consultant on education policy, emphasises that education is a highly regulated public utility in which rules can govern everything, from what goes into textbooks to how many children there are in a class. And local politicians can change rules or policy unpredictably. This causes problems for a start-up which wants to get its technology into a lot of schools. Andreessen Horowitz, a Silicon Valley venture capitalist, takes the problem so seriously that it avoids any edtech investment in which a school or school district would be the main buyer. One way round this is for small companies to be swallowed up by the education arms of established corporate giants. Wireless Generation, a personalised-learning firm that has become the core of Amplify, was bought by News Corp in 2010 for $340m. McGraw-Hill Education bought Bookette, a company that provides online performance measurement, in 2011, and an adaptive-learning company, Aleks Corp, in June. Pearson acquired Schoolnet, another personalised-learning firm, for $230m in 2011 and Embanet Compass, which provides online services to higher education, for $650m in 2012. Another start-up strategy, which avoids having to deal with the difficulties of winning procurement contracts in such a complex market, is to give the wares away. This, the companies hope, will convince students, teachers and parents to adopt the technology on their own or push to make it more available. Quizlet offers a flashcard tool this way; Noodle, a course-recommendation service; Chegg, help with homework. Their theory is that once the technology is widely used it will be easier to persuade schools to spend money on expensive offerings. Persuading schools to buy is only the first step, though. America’s teaching unions fear a hidden agenda of replacing properly trained humans with some combination of technology and less qualified manpower, or possibly just technology. Unions have filed lawsuits to close down online charter schools, including what looks like a deliberately obtuse proposal to limit enrolment at such virtual schools to those who live in their districts. These concerns are not completely unfounded. Teachers at Rocketship’s schools in San Jose earn 20% more than the local going rate, but will have up to 100 children in a class when they are working one-to-one in online learning laboratories. This gives Rocketship lower costs compared with schools of a similar size. It also means fewer teachers per pupil. Unions also suspect that more technology implies heavy-handed monitoring of teacher performance, a worry reinforced when Mr Gates proposed putting a camera in every classroom to help with assessments. The promise in all this for teachers is less drudgery, since some of their duller tasks can be automated, and interesting new challenges as they work out how to reorganise their classes. If the technology can be used as an extra pair of hands in the classroom, teachers will find it possible to do more. The American Federation of Teachers has invested $10m alongside TSL Education, a British firm, in a joint venture called sharemylesson.com, a website that lets teachers share lesson plans and other tips. Lore, a New York start up recently acquired by Noodle, has developed a platform somewhat like Facebook where teachers can share coursework and grades, and where pupils can converse with their teacher and each other. A similar network, called Edmodo, lets parents in too. Even if teachers and their unions can be persuaded, two worries will linger. One is what all those pupil-data will be used for. “We get millions of data points per day,” says Jose Ferreira, the founder of Knewton, a New York company which offers ways of adapting content to individual pupils, and makes it easier to spot when a pupil will fail. “We know more about our users than any company has ever known about anyone.” As with any enterprise involving big data, it is possible to imagine such stores of information being misused. The second worry is that the benefits of all this change may end up disproportionately with the rich, the bright and the highly motivated, who already make most use of online resources. The worry may be misplaced, though. Used properly, edtech offers both the struggling and the brilliant a route to higher achievement. The point is to maximise the potential of every child. As the Council on Foreign Relations reported recently, America continues to slip down the international rankings in education, falling during the past three decades from first to tenth in the educational level of those leaving high school, and from third to 13th for college students. Education technology could reverse this trend—if it is not jinxed by politics, bureaucracy and outdated institutional structures. Countries where it is not now have the chance to race ahead.